Overwintering monarch butterflies return year after year to California groves. Photo taken in Pacific Grove, CA by agunther / Wikimedia Commons. Just two years ago, 4,188 monarch butterflies at Ardenwood Historic Farm in Fremont clustered in dense groupings on their favorite eucalyptus trees. On sunny days, they fluttered and basked, flashing their orange and black wings to the delight of thousands of people who came to view the seasonal wonder. This year, though, Ardenwood naturalist Mindy Castle reported that after a good showing of about 1,000 butterflies in November, the cold snap in December sent most of them fluttering to parts unknown. 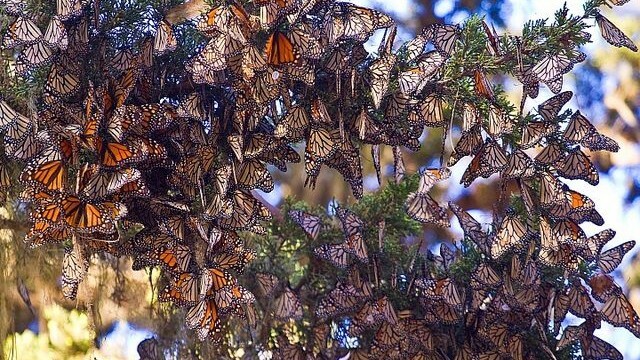 Only about 30 or 40 monarchs remain, most of them abandoned their Ardenwood overwintering site. Monarch butterflies that return each year to their overwintering sites are up to five generations removed from the butterflies you might see in the groves each winter. It’s kind of like us looking at our homes and thinking, “Someday, my great-great-great-great grandchildren will return here.” The overwintering generation of butterflies disperse east and north in the spring, laying their eggs on milkweed in the Central Valley of California and even as far east as Arizona and north to Washington. They grow and mate, with successive generations dispersing further, until the migrating generation matures, migrates and, voilà, they return again to the winter groves. Monarch Alert, affiliated with Cal Poly, San Luis Obispo gives a fuller description of the fascinating lives of monarchs. The great mystery of monarch migration lies in the genetic hard wiring that leads the butterflies back to the same overwintering areas. There seems to be some flexibility in that hard wiring, though, that can help them adapt and try a different spot when conditions don’t meet their needs. 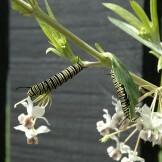 Perhaps this year Ardenwood monarchs moved closer to the coast or further south when the weather turned cold. Pacific Grove reported 11,000 monarch butterflies from their January 7, 2014 count. You can learn more about this grove of monarchs, how they count them and considerations for preserving their overwintering grove in this KQED Science video from last year. The Xerces Society, in partnership with the Monarch Joint Venture, has developed a 5-step strategy to protect California’s overwintering monarch groves. You can help monarchs by providing milkweed and nectar flower habitat in your yard with suggestions for butterfly habitat gardening from the East Bay Regional Parks (note, phone numbers are out of date so see EBRPD’s website for current contact information) and more about the Xerces Society’s efforts to create both large and small scale restoration of vital milkweed habitat. 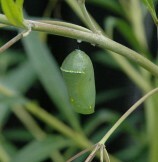 You can also participate in monarch butterfly programs through February and still see monarch eggs and larvae at Ardenwood. Coyote Hills Regional Park, near Ardenwood, also has a beautiful butterfly habitat garden at the visitor center with monarch butterfly eggs and larvae. For a complete list of overwintering sites monarchs can be seen in California, visit the Xerces Society's website.